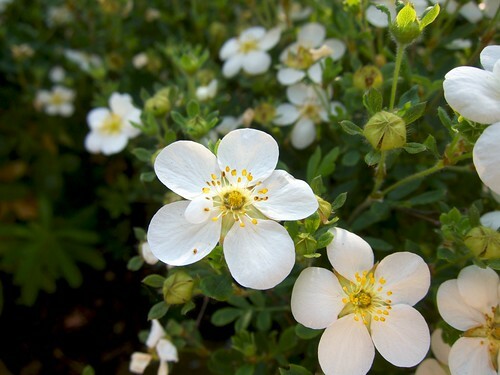 Potentilla is a genus of lovely flowering shrubs and small perennials from the family of Rose. These summer flowering shrubs make excellent plants for beginners. 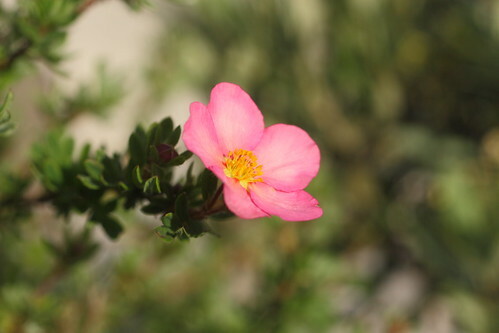 Most species, such as Potentilla fruticosa, grow in almost any soil and are resistant to pests. Potentilla fruticosa (Buy online) grows from 1 to 3 feet in height and produces attractive yellow flowers in late spring. Flowering continues till early days of fall. Potentilla fruticosa can be used to border plants, cover the ground in mass plantation schemes or as an outdoor ornamental plant. The ornamental value of the plant is because of its compact silvery-green leaves and attractive yellow flowers. P. fruticosa ‘Abbotswood’ is grown as a hardy flowering shrub that produces abundance of white flowers. P. parvifolia ‘Goldfinger’ is known for its large and prominent yellow flowers. P. fruticosa ‘Goldstar’ grows as a compact and low-growing flowering shrub. 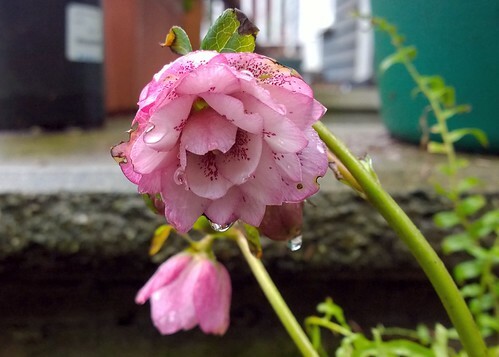 It is suitable for growing as a ground cover. Flowers are yellow. P. fruticosa ‘McKay’s White’ produces very nice white flowers. P. fruticosa ‘Pink Beauty’ is the most beautiful flowering shrub in this genus. 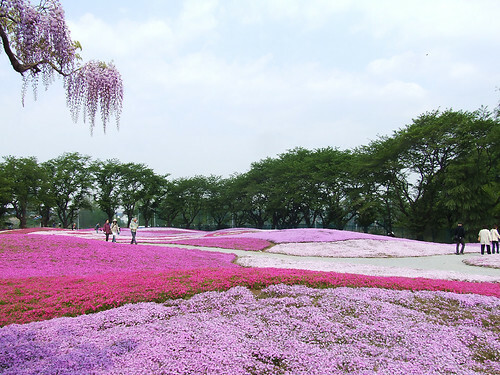 It is known for its lovely pink flowers. P. fruticosa ‘Red Robin’ produces yellow flowers that gradually change their color to yellow-orange. Phlox subulata (Buy online), also known as Moss Phlox, is an excellent ground cover for low-maintenance landscapes. Known for its ability to survive under various conditions, Moss Phlox makes an excellent plant for covering unsightly patches. It can be grown as a bordering plant, as a ground cover in rock gardens, as cascading plant against walls, or as a charming creeper in gardens and landscapes. 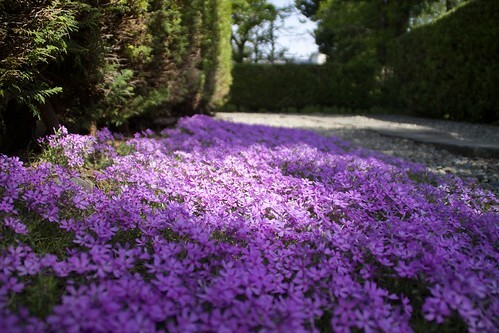 Consider Moss Phlox when you are looking for a ground cover that does not require much care and performs well in a sandy, rocky or low-fertility soil. Phlox subulata is propagated from seeds, layering or stem cuttings (cuttings especially shorter ones root quickly). Young plants require moderate watering in a well-drained soil. They also benefit from a little application of fertilizer in early spring. Once established they do not require much maintenance. Except for annual pruning (preferably in winter to encourage better growth in the following season), this lovely ground cover will thrive under full sun and require occasional watering.It usually spreads 1 meter across and gain a height of up to 10 cm. Depending on the climatic conditions, a young plant may require 2 to 5 years to reach this size. Moss Phlox bears flowers of magenta pink-purple, red, fuchsia, violet, cream and white colors appear in mid-spring. Popular varieties include: Phlox subulata ‘Candy Stripes’, Phlox subulata ‘Snowflake’, Phlox subulata ‘Red Wings’, Phlox subulata ‘Drummonds Pink’, and Phlox subulata ‘Emerald Cushion’. Buy Moss Phlox online. Buddleja is a large genus of flowering shrubs and small trees known for their fragrant flowers. Most species in the genus of Buddleja produce lush green foliage with silvery-white underside. The attractive foliage is contrasted by colorful and fragrant spring or summer flowers that attract wild birds and butterflies to the garden. 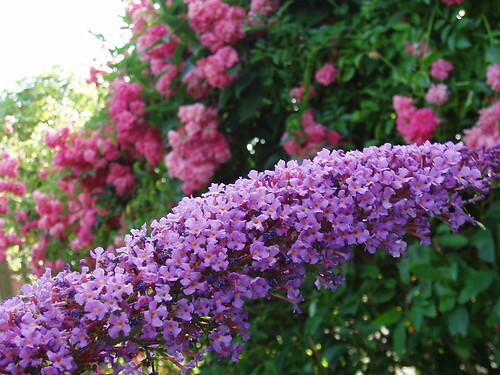 Most species of Buddleja are fast growing shrubs or small trees ranging from 4 to meters in height. Propagation can be done from seeds or hardwood cuttings. Being low-maintenance plants, Buddleja are suitable for xeriscapes or low-maintenance gardens. A large number of Buddleja hybrids and cultivars are available easily and can be grown in most tropical and sub-tropical climates where are provided with moderate watering and protected from heavy frost. Lonicera sempervirens is a fast-growing vine from the famous Honeysuckle family. Also known as Carol honeysuckle and sometimes as Trumpet honeysuckle because of its trumpet shaped flowers, this lovely vine can be used as a nice climber for pergolas and trellis. 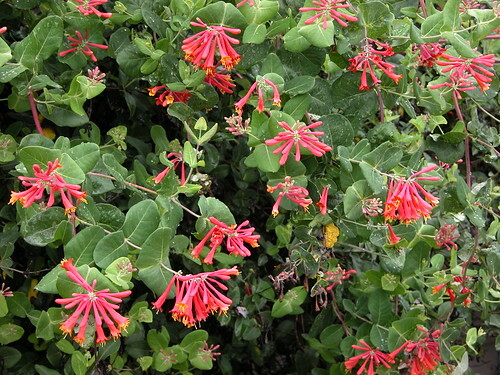 Lonicera sempervirens (Buy online) grows up to 5 feet and produces showy trumpet-shaped flowers of scarlet or red-orange color. Summer flowers are followed by red berries. Both flowers and berries attract wild birds. The vine grows in a well-drained soil under full sun. Though it can grow in shade, Lonicera sempervirens is primarily a sun loving vine. Brighter sunlight encourages abundance of ornamental flowers. Lonicera sempervirens is a vigorous growing vine and might require annual pruning. It is evergreen in warm climates but sheds most of its foliage is colder climates. It can be propagated from layering or softwood cuttings. Hellebore is a small genus of winter-hardy perennials. They are loved by gardeners for their ability to grow in shady spots and produce flowers in late winter when very few plants can bloom. The flowers are actually colorful sepals that assume the shape of star-shaped flowers. These attractive ‘flowers’ bloom in various shades of purple, white, yellow, pink and red. These lovely flowers can last for two to three months thus making these plants a good choice for late winter or early spring interest. Hellebores can be grown easily from divisions. They prefer a rich and well-drained soil in a shady or partially sunny spot. Avoid over-watering and water only when the soil is dry. Most Hellebores are not fussy about growing conditions and can be easily mixed with common ground covers and evergreen plants in a garden bed. Mature plants will only require occasional cleaning up of withered leaves. A general purpose fertilizer can be applied to encourage healthier blooms to plants grown in containers. Helleborus x ericsmithii `Pirouette’ (rose flowers), Helleborus x ericsmithii `Ruby Glow’ (rose-pink flowers, Helleborus x ericsmithii `Winter Sunshine’ (cream flowers), Helleborus atrorubens (dark violet flowers), and Helleborus x ballardiae (burgundy flowers). 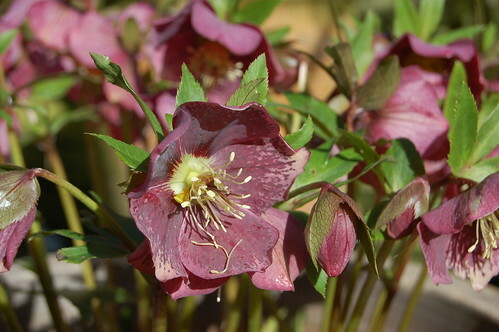 Hellebores are also sold as Lenten Rose or Christmas Rose. 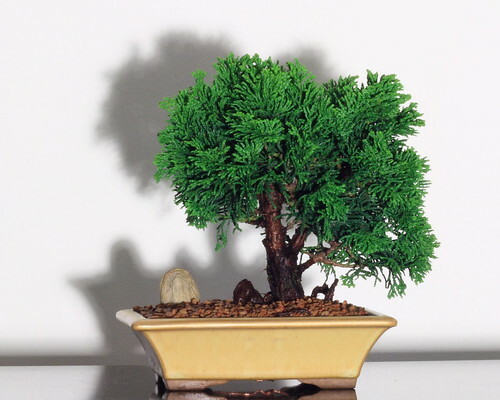 Chamaecyparis obtusa, also known as Hinoki cypress, is an evergreen ornamental tree from the cypress family. This slow growing tree is used in gardens for their ornamental value. In its natural habitat in Japan, Chamaecyparis obtusa can grow up to meters though it takes much time for a plant to reach this size. Many dwarf cultivars are grown and sold commercially as ornamental trees. Chamaecyparis obtusa is characterized by dense scale-like foliage that varies in colors from blue-green to bronze and from yellow to gold. 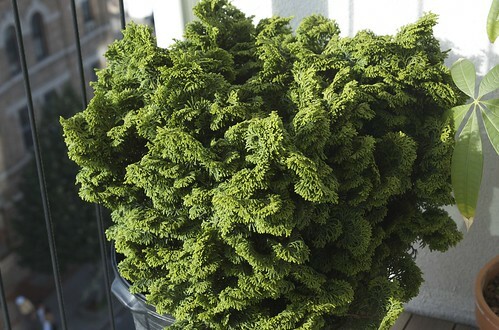 Chamaecyparis obtusa grows as an erect evergreen tree and eventually assumes a pyramidal or columnar shape. Many cultivars of Chamaecyparis obtusa vary in size and shape. Most of them can be easily trained to make excellent bonsai. Attractive reddish-brown and nicely textured bark, and irregular branching add beauty and personality to these bonsai specimens. 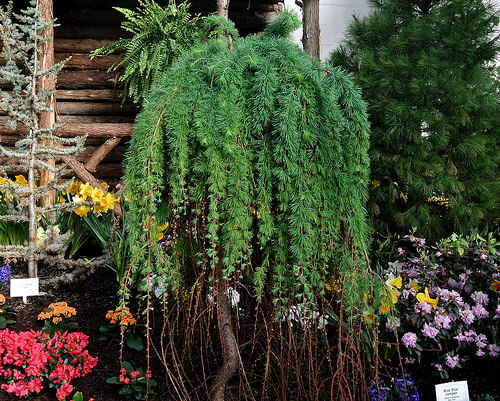 Besides its ornamental value, Chamaecyparis obtusa is grown for it valuable timber. The fine grained wood from Chamaecyparis obtusa is highly resistant to rot. In Japan, this high quality, aromatic timber is used in construction. Chamaecyparis obtusa can be grown easily in slightly moist and fertile soil under full sun. Chamaecyparis obtusa ‘Aurea’: Grows upright and produces attractive yellow foliage. Chamaecyparis obtusa ‘Baldwin Variegated’: Grows as a dwarf ornamental tree with green and yellow foliage. Chamaecyparis obtusa ‘Butter Ball’: Grows as a dwarf ornamental tree with globular growth and produces dense foliage with yellow tips. Chamaecyparis obtusa ‘Dainty Doll’: A slow growing dwarf cultivar producing rich-green lacy foliage. Chamaecyparis obtusa ‘Nana’: Known for its dark-green, dense and very attractive foliage. This slow-growing variety tends to natural form a miniature shape. Carex eburnean is a versatile plant. Commonly grown as a tough ground cover, this nice little plant performs very well under shade or sun and in moist as well as dry areas. You can grow it as a ground cover, companion plant in a rock garden or as alternative to ornamental grasses in Xeriscape. It can also be grown as a nice specimen plant in containers. Carex eburnean or Bristleleaf sedge forms small mounds of needle-shaped tufted leaves. The plant can grow up to 8 inches and width. The soft tufted leaves of Carex eburnean hide a very hardy and adaptive plant that does not require much maintenance. Typically, it performs very well in a slightly moist but well-drained alkaline soil under partial shade. 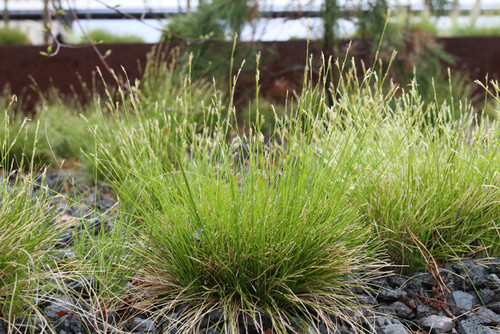 However in urban settings, Carex eburnean can adapt to different growing conditions. When grown in urban settings Carex eburnean can be used to fill spaces where most plants fail – under shady trees, lands that are not frequently irrigated, and soil that is too sandy to grow your favorite plants. Flowers, though not prominent appear in spring followed by formation of small, fluffy seed heads. Carex eburnean is propagated from seeds and division of rootball from spring to autumn. Common names of Carex eburnean are: Bristle-leaved sedge, Ebony sedge, and Ivory sedge. Phalaris arundinacea ‘Picta’ is a popular ornamental grass for growing in containers as well as in garden landscapes. This lovely grass is commonly known as Ribbon Grass because its green leaves and beautifully stripped in contrasting white or cream. Phalaris arundinacea ‘Picta’ makes a nice choice when you want to cover slopes or empty spaces in your garden landscape. It spreads quick and easily when grown in a sunny spot and provided with moist soil. 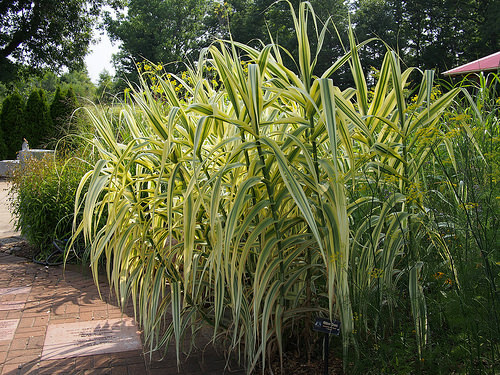 Therefore it makes a nice ornamental grass when grown around ponds or under shady trees (it grows slowly under shade). Like most ornamental grasses, Phalaris arundinacea ‘Picta’ can be easily divided from rhizomes. The best time of the year for planting ribbon grass is spring or fall when you can take out healthy rhizomes from the root zone and plant them in to the ground or containers. If you do not have plenty of space to accommodate this spreading grass, grow it in containers as evergreen ornamental plant. Otherwise invasive, ribbon grass is easy to maintain and control in containers. Usually a 5 gallon container is a good size. When allowed to grow freely in the ground, Phalaris arundinacea ‘Picta’ can grow up to 3 feet in height and spread from 3 to 4 feet across. Be careful when you are planting ribbon grass with other plants because of its rapid spreading and sometimes invasive root system. Phalaris arundinacea ‘Picta’ is a low-maintenance grass. It is generally a pest-free grass that requires regular watering and light pruning in midsummer to encourage fresh growth. Alliums, commonly known as Ornamental Onions, are popular perennials among gardeners because of their graceful flowers and ability to grow in many different conditions. Most Alliums are characterized by their tall flower stalks (up to 3 feet) that stand like sentries with big, round flower heads (up to 5 inches). Their prominent flower heads make Alliums very useful for providing a nice and attractive background to low-growing bloomers in flower beds. Growing Alliums should not be a big challenge even for beginners. They are drought-tolerant, resistant to pests, and low on maintenance. They also come in a wide range of variety in terms of heights, blooming period, and form and color of flowers. Alliums are grown from bulbs planted in the fall. Bulbs should be planted at a depth of four times the diameters of bulb. 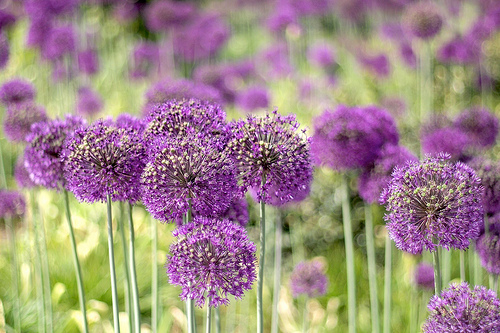 Alliums generally prefer a rich and well-drained soil under sunny conditions. If you are growing them in poor soil, feed them with a general fertilizer in early spring or top up the soil with a layer of compost [Also read: How to prepare your own compost]. Most varieties start blooming from late summer to early summer. Flowers, especially of late blooming verities, last longer. Both fresh and dry flowers make excellent addition to flower arrangements. As end of season approaches, leaves start straggling and should be cut back, if required. Once flowering is over, bulbs can be lifted and stored for the next harvest. Allium ‘Purple Sensation’ produces large (3 inches or more) purple flowers on tall (up to 3 feet) stalks. 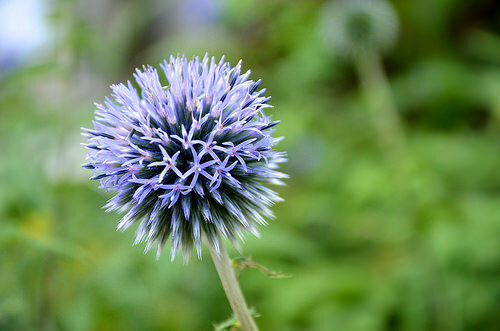 Allium caeruleum or ‘Blue Allium’ produces very attractive flowers of sky-blue color in spring and summer. Allium schoenoprasum or Chives is a useful herb that produces nice pink flowers from mid to late spring. Allium ‘Globemaster’ is a popular variety known for its huge flowers of purple color. Allium ‘Millennium’ is a great bloomer for the late summer season. This variety is known for its long lasting lavender flowers. Allium tuberosum or Garlic Chives are attractive border plant because of their delicate form and nice white flowers. 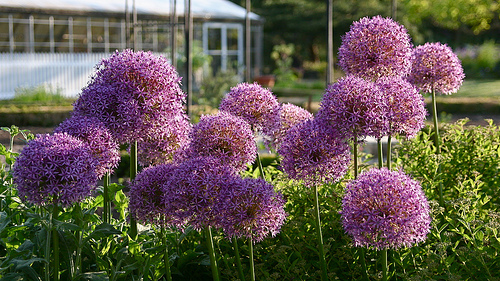 Allium aflatunense is known for its large and prominent pink-purple flowers that sit on tall flower stalks. Other popular species are: Allium moly (Golden Garlic), A. cristophii (Stars of Persia) and Allium ‘Mount Everest’.